Here are my photos from the antique hexagon exhibit at the Paducah Rotary. This one was my favorite. It was a strippy quilt using all hexagons. A close up of the strippy quilt. If you can zoom in on this photo, you can see that the white in between the strips are individual hexagons. These antique quilts were in great shape. This is another interesting setting. Here is a close up of the center. It's a medallion surrounded by lighter hexagons. I think these were 1/2" hexagons. We only had an hour to see all of the quilts and vendors inside the Rotary. 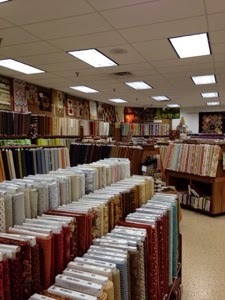 This is where Cherrywood fabrics have their booth. I had to look and power shop. More tomorrow. 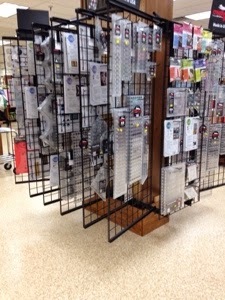 After visiting all of the places around town and returning to the National Quilt Museum (our bus pick up point), someone said that Paper Pieces had a booth inside the museum lobby. Here is what I saw. This was a quilt made for Judie Rothermel's 25th anniversary. This was behind the lady doing paper piecing demos at the booth. 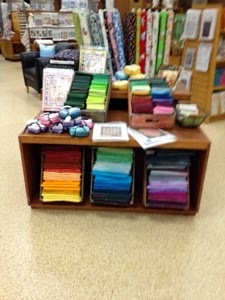 There were paper piecing projects everywhere. This was on the table in the booth. Look at the plastic container of paper piecing and the stack of stars on the corner of the table. 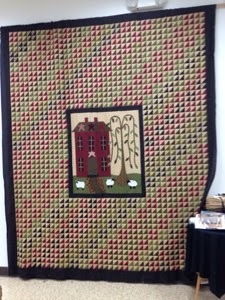 This quilt was being used as a table cloth on the demo table. This is the food tent in front of the expo center where the quilt show is held. Even the red bull had a quilt on him. More tomorrow. 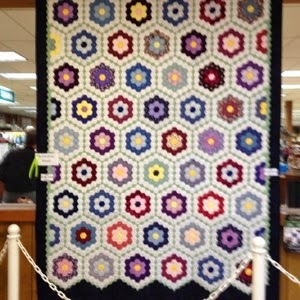 I'll show you the quilts from the Paducah Rotary antique hexagon exhibit. I had a couple of objectives this trip besides wanting to see the quilt show and shop the vendors. 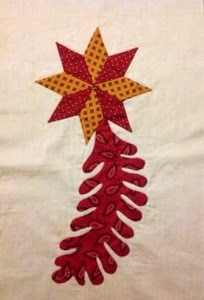 If you are a regular reader of my blog, you know that I love English paper piecing. The bus stopped at the National Quilt Museum. 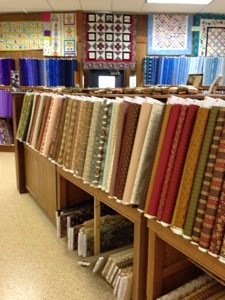 I have visited the museum a couple of times before, so some paper piecing addicts and I visited a few other shops around town. 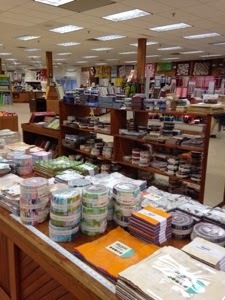 The photo below is The Hexie House, home of paperpieces.com. 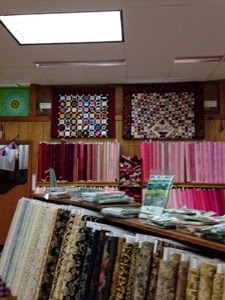 I knew they would have a booth at the quilt show, but I wanted to stop here. I think this is block 1 of the Millefiori Quilt Along. Patchwork of the Crosses blocks and paper pieces. These were either 1/2" or 3/4" hexagons. Here's just one of the spinners of paper pieces available. There are lots of ways to travel around Paducah. We walked around town going in and out of different shops. We made a stop at one of Eleanor Burns shops along the way. This is across from the National Quilt Museum. 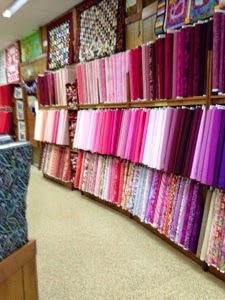 There are places like this selling fabric all over town. Here is the Primitive Gatherings booth in one of the places we stopped. That's all for today. I'll post more tomorrow. Thanks for stopping by and sharing part of my trip! Here are all of my Ohio Collection blocks to date. 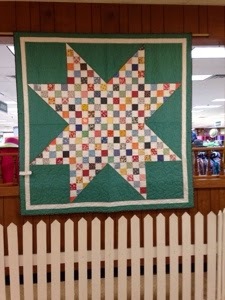 The blocks are from the Ohio Collection book by Anita Shackleford with substitution blocks from Album Quilts of Ohio's Miami Valley by Sue Cummings. I haven't accomplished a lot of sewing this week, but I did the Double T block. I love to draw in Electric Quilt and print out paper piecing patterns whenever I can. The default block size is 6 inches. I completed the 6" block on the left, and then I checked the Ohio Collection book. The block was supposed to be 12", and that explains why it looked so out of place to me. So I redid the block to finish at 12", and the smaller one will go into my orphan block collection. After returning from The Jane Stickle Retreat in Shipshewana, I had some catching up to do here at home. And, as you are reading this post I am on the way to the AQS Quilt Show in Paducah. This is my birthday month, and so far it has been just great with a trip to the Chicago show, and 6 days in Shipshewana and now two days in Paducah. While I was at the retreat in Shipshewana, a couple of the girls were starting the Little Gem sew along with the Temecula Quilt Company. Since they sold the 1" Jewel paper pieces at Yoders, I decided to buy a couple of packages and join in. These will work nicely with hexagons, and I think they will add interest to a hexagon quilt. 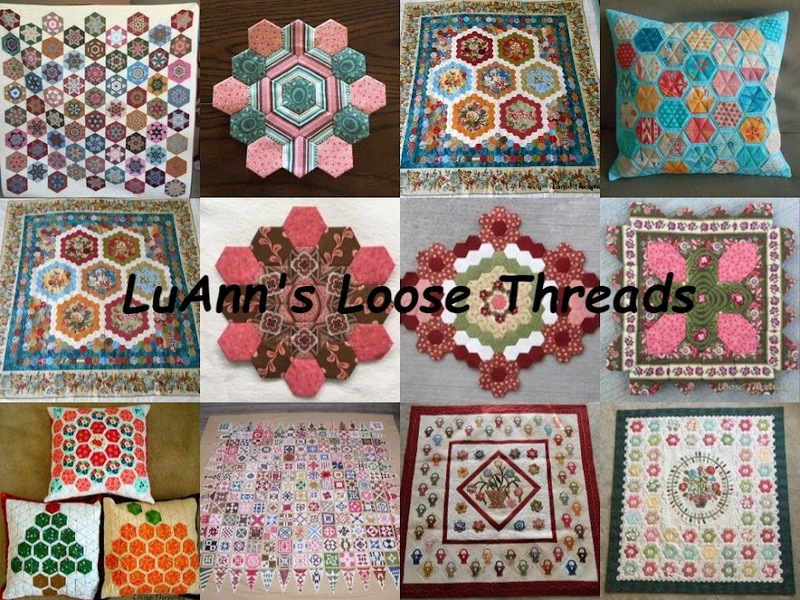 You can stop by their blogs to see their Ohio Collection blocks. 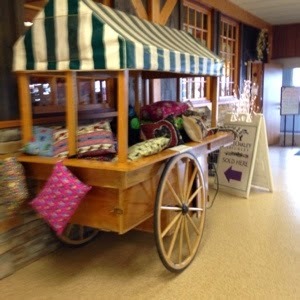 We had a great time at the Jane Stickle Quilt Retreat last week. I've been trying to get all of my Shipshewana photos in one place where you can view them if you choose. I'm using Shutterfly. Since I'm the originator of the blog, I can't see what this is going to do when I publish it. So if this takes too long to load or does something else, would someone please email me or post a comment so that I know? Thanks. Here are the photos. Below where it says Click here to view these pictures larger, that takes you to my Loose Threads Photo page. There is a link there to view slideshow, and the photos will be full screen (I think). I'm still in Shipshewana at our quilt retreat, and I've done a bit of stitching. Here are my latest Ohio Collection blocks. 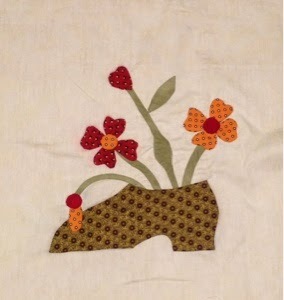 This shoe with flowers was designed by Karen at Log Cabin Quilter blog. I appreciate Karen sharing her patterns with me. The red on my flowers bled some so I have to work on that when I get home. This is Star and Princess Feather from Anita Shackleford's Ohio Colkection book. Both blocks are hand appliquéd. 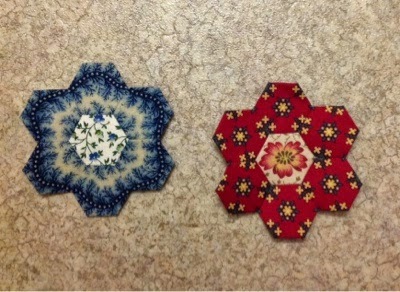 I've also finished two more 3/4" hexagons. 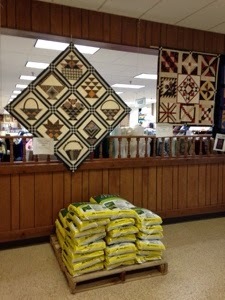 I arrived in Shipshewana, Indiana, on Tuesday for our semi annual quilt retreat at the Farmstead Inn. I've done some shopping, eating, and talking. 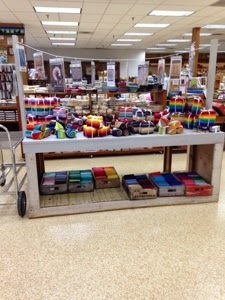 I took a few photos today when I walked over to Yoders Department Store. 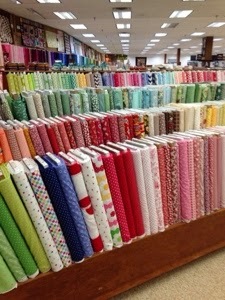 Some photos are blurry, but you can see all of the fabric temptation. There are so many solid colors here that it's hard to choose. This beautiful table makes me smile each time I see it. 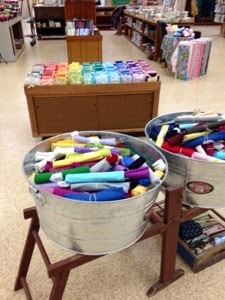 There are lots of jello rolls, charm packs, layer cakes, and other precuts. It really is a bit overwhelming. I think I bought the pattern for this quilt several years ago. This photo is blurry, but I love these hexagons. This quilt is set like my Road 66 quilt with the tiny diamond path. They have a ruler for everything. 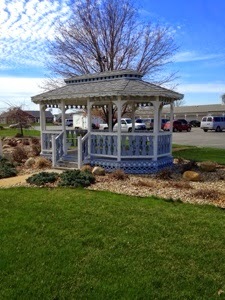 I've spent some happy hours in this gazebo with friends. 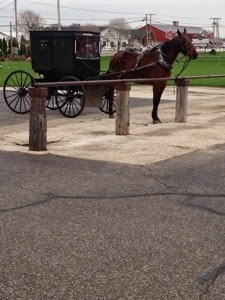 The horse and buggies are everywhere. It's fun to walk around Shipshewana because you see things like this. It made me laugh. 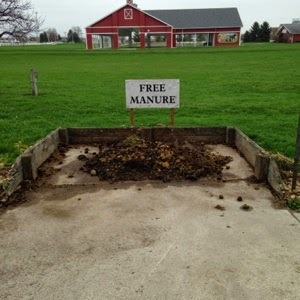 My first thought was .....there's free manure everywhere.